Like MPTool iPtool popular software resetter for Canon printer. 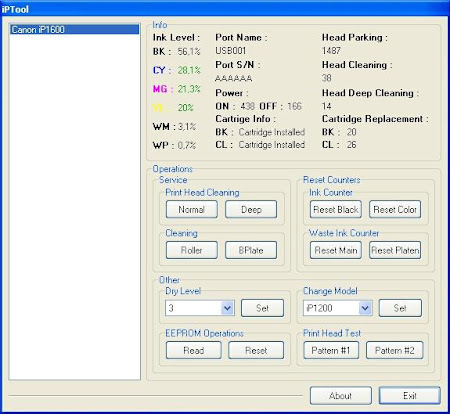 The software is designed to solve problem caused ink counter on Canon Pixma iP1200, iP1300, iP1600, iP1700, iP1800, iP2200, and Canon iP2500. The Canon service tools provide complete tools to maintenance and servicing Canon printer. The latest software version can be downloaded on following link: Download the software iPTool version 1.1.3. Printer Maintenance; cleaning tools and head test. Service features to reset counter and solve printer blinking. Share this Printer Software or Resetter Info!